Monday, April 15 - 4:30 p.m. These lectures are free and open to the public. Sponsored by the Soyka Fund for the Humanities. 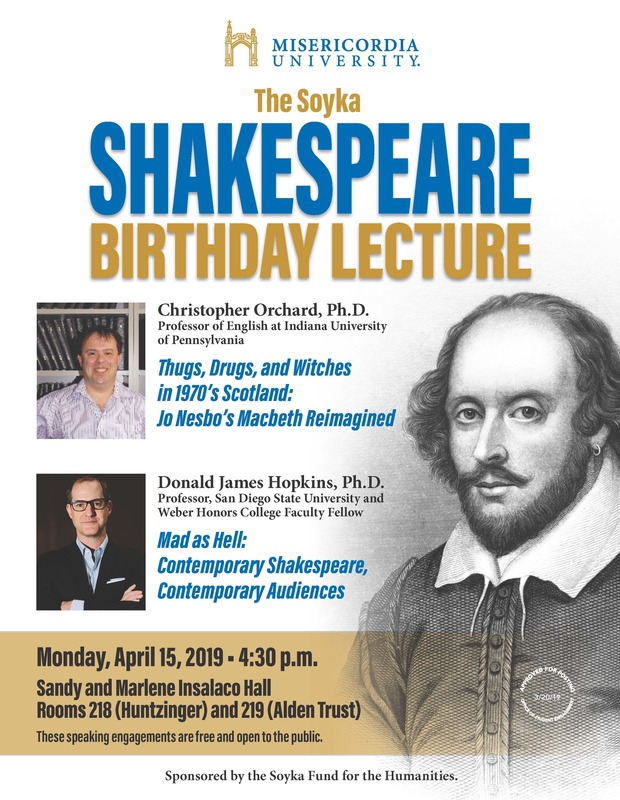 As part of a lecture series celebrating Shakespeare's birthday, the following lectures will be presented. Christopher Orchard, Ph.D. "Thugs, Drugs, and Witches in 1970's Scotland: Jo Nesbo's Macbeth Reimagined" Donald James (D.J.) Hopkins, Ph.D. "Mad as Hell: Contemporary Shakespeare, Contemporary Audiences"
Click here to view the event flyer in full!